'Explosions' heard at funeral procession Jump to media player Israeli police have clashed with Palestinian protesters in East Jerusalem as thousands of people attended the funeral of a murdered local teenager. Mourners on streets for Khdair funeral Jump to media player Thousands of people have taken to the streets of East Jerusalem for the funeral of Palestinian teenager Mohammed Abu Khdair, murdered earlier this week. Anger flares after teenager's murder Jump to media player There have been more clashes between the Israeli security forces and Palestinians, following the kidnap and murder of a Palestinian teenager in a suspected revenge attack, for the killings of three young Israelis. 'Violence is not the path' appeal Jump to media player Yishai Frenkel, the uncle of Naftali Frenkel, one of three Israel youths whose bodies were found in the West Bank on Monday. says ''violence is not the path'' in the Middle East. Cousins: 'All we can do is throw rocks' Jump to media player Two cousins of 17-year-old Mohammed Abu Khdair, who was abducted and murdered in Jerusalem on Wednesday, tell Yolande Knell about the circumstances surrounding his death. 'My son wasn't answering' Jump to media player Hundreds of Palestinians have clashed with Israeli police in east Jerusalem after a Palestinian teenager was found dead in a forest. 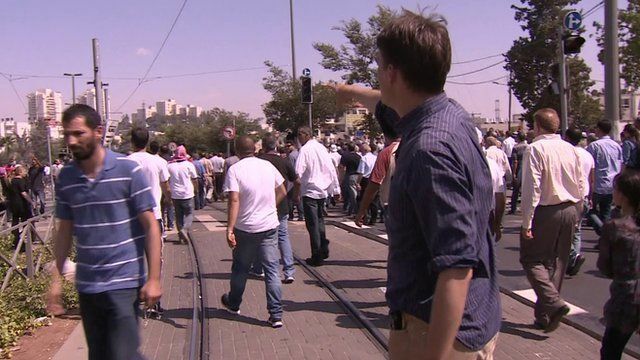 On 'front line' in East Jerusalem Jump to media player Clashes have erupted between Palestinian youths and Israeli police after the body of a Palestinian teenager kidnapped in East Jerusalem was found. Israeli police have clashed with Palestinian protesters in East Jerusalem as thousands of people attended the funeral of a murdered local teenager. The BBC's James Reynolds watched the procession go past.